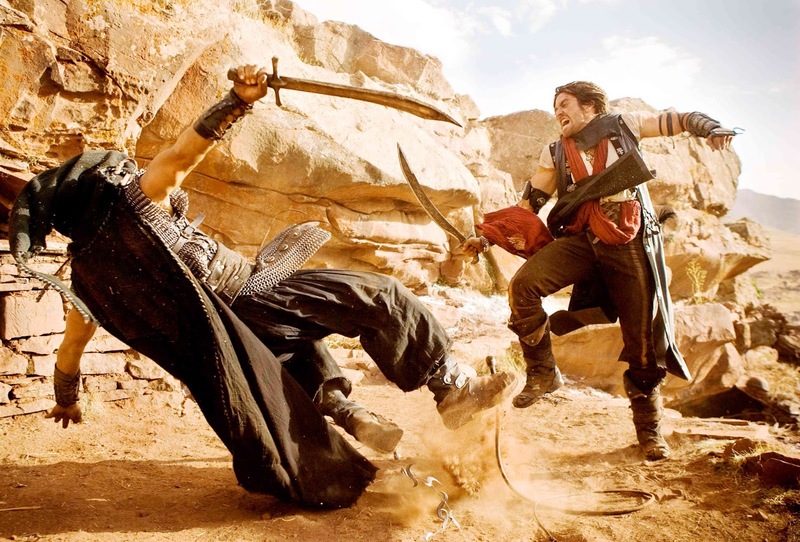 A video game adaptation, Prince Of Persia: The Sands Of Time contains some promise but also suffers as an overproduced spectacle occasionally trounced by excessive special effects. The Persian Empire's kindly King Sharaman (Ronald Pickup) adopts scrappy street kid Dastan as his own child. Dastan (Jake Gyllenhaal) is raised as a brother to the king's sons, heir to the throne Tus (Richard Coyle) and the intense Garsiv (Toby Kebbell). 15 years later, Tus, his brothers and their uncle Nizam (Ben Kingsley) lead the Persian army on their latest military campaign. They debate whether to sack the mystical city of Alamut. Spies working on behalf of Nizam uncover evidence that Alamut is manufacturing and supplying weapons to Persia's enemies, convincing Tus to attack and defeat the city. Dastan's group of unconventional and highly athletic warriors are instrumental in forcing open Alamut's well-defended gates. The victorious Persians come face to face with the defeated and exceptionally beautiful Tamina (Gemma Arterton), Princess of Alamut, but find no evidence of weapons being manufactured. Instead, Dastan realizes that an evil conspiracy is at play, and the real objective of the attack is to seize a magical dagger powered by the sands of time, which can unwind history. Dastan finds himself in possession of the dagger but accused of treachery and on the run with Tamina. He needs to clear his name, save Persia from a dark fate and help Tamina safeguard her destiny as the guardian of the dagger. Transforming a video game into an engaging film is always a challenge, and this effort from Disney gives it a good go while staying within reach of the young adult core target market. The characters are fleshed out, a fairly complex plot is created, and themes of family, the bond between brothers, benevolence, honour and destiny are woven into the narrative. The relationship between Dastan and Tamina is also at least interesting, and the two take their time to transition from foes to allies to lovers. Director Mike Newell also delivers plenty of attractive visuals, making good use of the desert, and finding some stylish, dramatic shots of silhouetted warriors. The camera work often echoes the trademark fluidity of the original games. But the film stumbles when the CGI special effects kick in. While the Prince's remarkable jumping and running skills are already overplayed, Newell loses all perspective when it comes to several scenes of mass combat, which are barely coherent, and fall over the cliff of credibility when countless merciless Hassansins (secret mercenary assassins) enter the picture. Worse still are sequences of carnage with terrain and buildings disintegrating in so much incomprehensible rubble. The computers are overclocked to render over-the-top images tumbling over each other, and the end result is a mess of graphics that make little sense but all the same swallow up the characters. The film also struggles with a dagger-and-sand story that gets ever more finicky as the film rushes to its climax, with Tamina revealing new angles on the mysteries of the small dagger and mountains of sand in frustratingly small increments and just when it suits the plot. Other than being too white and speaking in bewildering English accents while representing Persians and Asians in the desert, the performers are adequate. Gyllenhaal and Arterton make for an attractively dreamy couple, while Alfred Molina steals the scenes he's in as an unlikely tax-evading entrepreneur specializing in, of all things, ostrich racing. Prince Of Persia: The Sands Of Time is reasonably bloodless and harmless entertainment, but nevertheless an opportunity missed due to an over reliance on hard drive speed and not enough faith in character strength.